As one of the most creative animals in the Chinese zodiac, this is the year of the sheep and Sydney is celebrating galore from 13th February to 1st March. As the eight sign of the Chinese calendar and a truly lucky number, the Sydney Chinese New Year festival will boom during the Twilight Parade. Before we start on the event details, just account that some famous Aussies born in a sheep year include Keith Urban, Nicole Kidman and Heath Ledger. Kicking off at 730pm at Dawes Point, Hickson Roar Reserve will be bedazzled with lanterns, inspired by the ancient Chinese terracotta warriors. With the Sydney Harbour and Opera House backdrop, this stunning and inspiring exhibition will be launched by the city’s Lord Mayor. Within these 90 minutes, grab snacks from street food trucks, check out the traditional drumming, lion dances and the start of the Parade. It’s going to be really dazzling so bring your sunglasses! The next evening, put the Lunar Streets in your diary as the area will be slammed sideways with Thai, Chinese and Korean food like you’ve never had before. Following this, on the 22 February, the big parade kicks off at 8pm from the Town Hall and ends at Darling Harbour. It is free to watch but if you’re in the mood to splash out for a VIP ticket and guaranteed seating, it will cost you $66. With the sheep as an adored, calm and gentle animal, the Parade will tell a tale of all things woolly. It’ll include floats, huge projection lighting and magical lanterns, knitting grannies and Bo Peeps (kid you not!). As sheep are a core of Australia’s early farming success, expect to see a goldrush Chinese immigrant shepherd theme woven into the Parade. The finale includes a blast of fireworks at the Harbour, just before midnight. Ever seen dragons race in the water? Between the 28th February and 1st March daytime, you’ve got to see it to believe it at Darling Harbour. For over 2,000 years, Dragon Boat racing has been a fixture of Chinese culture and you’ll see 12 metre long boats racing through the bay, with carved dragon heads, tails and scales. For all visitors and locals, check out the Chinese New Year full line up – it’s hefty so start marking off notable events you want to cross off your wish list. 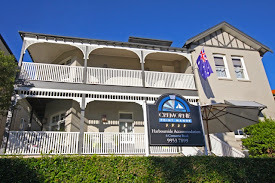 If you’re coming into the city, needing a place to stay and would like to see the festival from a different podium, check out Cremorne Point Manor, overlooking the Harbour. The views of the skyline are incredible and if you need visual reinforcement, check out the video on this boutique hotel’s home page. It’s why regular visitors flock to the Manor (pun intended).